Bacon bouquets are the way to your Valentine’s heart and belly. Anyone can get flowers and chocolates for Valentine's Day, but not everyone gets homemade bacon roses! 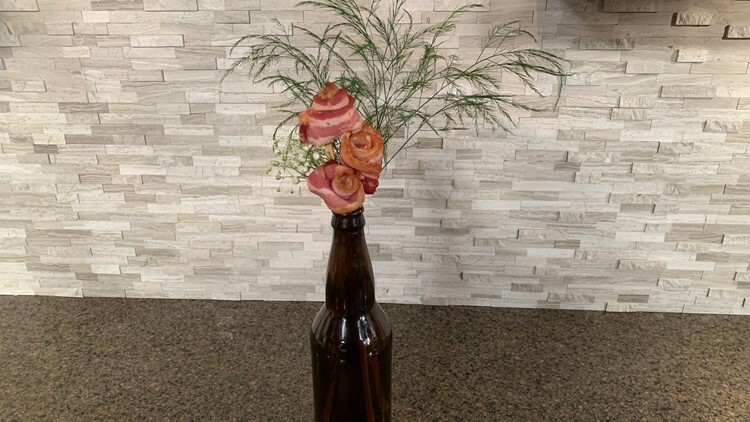 When Dave Chudowsky and Austin Love went to make their own flower bouquets for Valentine’s Day the morning team came up with an idea to surprise the guys with bacon bouquets. Executive producer Jenny Jordan, a lover of news and bacon, hit the kitchen to come up with TV-worthy creations. Bacon (Bacon from the meat counter works better then pre-packaged bacon as it is a little more sturdy. After watching several different YouTube videos, I felt confident that I could create the bacon bouquets. Full disclosure, I am a horrible cook and while I enjoy baking, I usually end up with nothing but Pinterest fails, so what could go wrong?!?! Take the bacon and put the fatty side down. Inset a skewer into one side and roll it up about 1/3rd of the way. With the final two thirds twist the bacon counter-clockwise and insert two toothpicks to make an X. NOTE: You can also just roll these up but the twist really makes them look like a rose. Brush bacon roses with syrup and sprinkle brown sugar on them. Place bacon in muffin tins and cook in oven for 20-30 minutes. After the bacon is cool you can remove the toothpicks and arrange how you like. You can use basil leaves and put them on a play or use skewers and arrange them in a vase (or opt for a beer bottle).